Hawaiian Airlines (Honolulu) yesterday (November 11) celebrating its 85th anniversary of continuous service for the Hawaiian islands and 85 years of flying as an airline. Hawai’i’s first interisland passenger service was launched on November 11, 1929 as Inter-Island Airways (see video above), with a flight from Honolulu to Hilo, which took a total of one hour and 40 minutes. The first flight to Kaua’i was made the following day and all the Hawaiian Islands were soon receiving air service on a regular basis. During this time, the first inflight treat offered to passengers was a stick of Wrigley gum to relieve ear pressure. The 85-year-old airline is reviving that in-flight amenity by handing out Wrigley’s Doublemint® gum, which is also celebrating its 100th anniversary this year, along with a commemorative postcard and historic logo stickers to more than 12,000 passengers on all of its neighbor island flights. Additionally, Hawaiian Airlines has also published a special commemorative book highlighting 85 years of its history and legacy which will be available for sale online at Shop.HawaiianAirlines.com in late November. Winners of Hawaiian Airlines’ social media contest series were given free rides throughout the day on the airline’s original airplane, a 1929 Bellanca CH-300 Pacemaker (above), which was restored in 2009 in celebration of the company’s 80th anniversary. Hawaiian Airlines’ 85th anniversary has been devoted to giving back to the community. In September, the airline unveiled a memorial wall at Kahului Airport honoring Capt. James Bertram Hogg, the pilot whose name was used for the airport’s three-letter code (OGG) (see video below). The event kicked off a three-month-long celebration that continued with an all-day community event in early October at the ‘Imiloa Astronomy Center of Hawaii in Hilo, the airline’s first destination. On November 8, Hawaiian Airlines also showcased all of its flight attendant uniforms dating back to 1943 with a fashion show at Honolulu Fashion Week. Throughout the month of November, Hawaiian Airlines Team Kōkua will be participating in statewide community service projects on the islands of Hawai’i, Maui, O’ahu and Kaua’i, restoring agricultural and historical sites. On November 11, 1929, Inter-Island Airways (the company changed its name to Hawaiian Airlines in 1941) launched Hawai’i’s first-ever scheduled interisland air passenger service using two Sikorsky S-38 amphibian propeller planes that carried eight passengers and two crewmembers, and had a top cruising speed of 110 MPH. Introducing airmail and air cargo service to the Hawaiian Islands in 1934. Becoming America’s first federally certified air cargo carrier in 1942. Introducing Hawai’i’s first aircraft with pressurized passenger cabins in 1952. Introducing Hawai’i’s first interisland jet aircraft in 1966. Becoming the nation’s first airline to operate a commercial flight with an all-female flight crew in 1979. Being the first Hawai’i-based airline to offer scheduled service between Hawai’i and the U.S. Mainland in 1985. 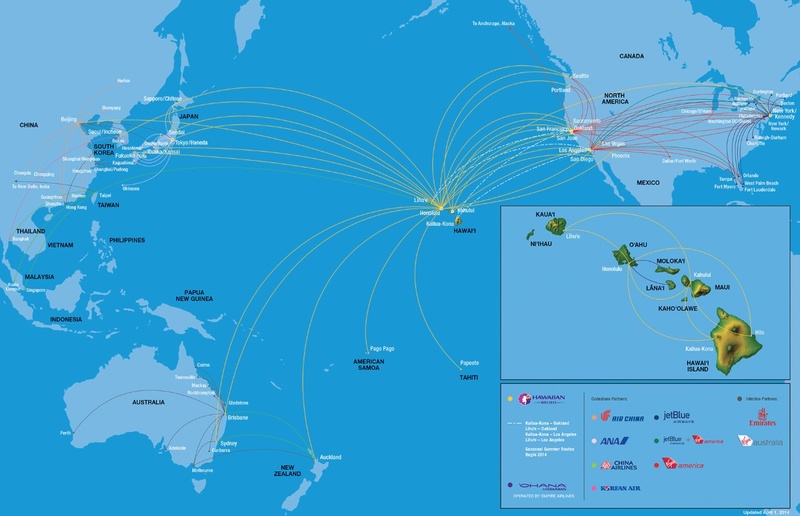 Today, Hawaiian Airlines’ route network encompasses six of the eight Hawaiian Islands, as well as 11 International and 11 U.S. Mainland destinations. Hawaiian Airlines operates a fleet of 51 aircraft – 18 Boeing 717-200 jets for interisland flights in Hawai’i; 11 Boeing 767-300 and 19 Airbus 330-200 wide-body jets for transpacific and international service; and three ATR 42 for its new turbo prop service ‘Ohana by Hawaiian that launched earlier this year. Hawaiian Airlines will have three more A330s joining the fleet by the end of 2015. By the end of year 2020, the airline plans to have 22 A330s total and 16 new narrow body A321neo aircraft. The airline will begin taking delivery of six new A330-800neo aircraft in 2019. Copyright Photo: Ivan K. Nishimura/Blue Wave Group/AirlinersGallery.com. This entry was posted in Hawaiian Airlines and tagged 154, Bellanca, Bellanca CH-300 Pacemaker, Hawaiian Airlines, HNL, Honolulu, NC251M on November 12, 2014 by Bruce Drum. Travelers to Maui will no longer have to puzzle over why Kahului Airport’s three-letter airport code is OGG. They need only spend a few minutes at a new wall paying tribute to Capt. Jimmy Hogg, the Hawaiian Airlines pilot and aviation pioneer for whom the airport is named. The 8-foot tall, 42-foot wide wall at Gate 19 was presented on September 15 by Hawaiian Airlines, the State Department of Transportation (DOT) and the Transportation Security Administration (TSA). Born and raised in Līhu’e, Kaua’i on a sugar plantation, Hogg grew up watching airplanes land at Nāwiliwili and decided at the age of 12 that he was destined to become a pilot. He started his aviation career on January 1, 1930 at Inter-island Airways as a mechanic’s helper. He became a co-pilot in 1936, and captain the following year. He went on to achieve a series of “firsts” with the airline, which was renamed Hawaiian Airlines in October 1941. Hogg made the first commercial flight after the attack on Pearl Harbor, coming under ground fire from those mistaking his plane for an enemy aircraft. On January 14, 1958, he flew Hawaiian Airlines’ first trans-Pacific flight, delivering a DC-6 from the West Coast to Honolulu. When the Civil Aeronautics Authority (CAA) began to standardize airport navigational beacons after World War II, it turned to Hogg for assistance. In 1957, when it was decided that Kahului Airport needed a three-letter code, the CAA took the opportunity to honor one of the pioneers of Hawai’i aviation. Hogg retired from Hawaiian Airlines in 1968 and passed away at the age of 84 in 1992. A video recap of his life is located at the bottom of this story. The dedication of the Capt. Jimmy Hogg Memorial Wall at Kahului Airport kicks off a series of celebrations leading up to Hawaiian Airlines’ 85th anniversary on November 11, 2014. On October 4, 2014, Hawaiian Airlines will host an all-day community event at the ‘Imiloa Astronomy Center of Hawaii in Hilo, the airline’s first destination. Residents of Hawai’i Island are invited to enjoy the museum as well as live entertainment and exhibits. Weather permitting, free rides will be offered on the airline’s original aircraft, a 1929 Bellanca CH-300 Pacemaker. Copyright Photo: Ivan K. Nishimura/Blue Wave Group/AirlinersGallery.com. Bellanca CH-300 Pacemaker NC251M (msn 154) is pictured at Honolulu. Trivia contests via Hawaiian Airlines social media channels will offer prizes throughout the months of October and November, including drawings for free sightseeing rides on the historic Bellanca. On November 11, 2014, Hawaiian Airlines’ Team Kōkua of employees will be participating in simultaneous community service projects on the islands of Kaua’i and Hawai’i. On November 11, 1929, Inter-Island Airways (the company changed its name to Hawaiian Airlines in 1941) launched Hawai’i’s first-ever scheduled interisland air service using two Sikorsky S-38 amphibian propeller planes that carried eight passengers and two crewmembers, and had a top cruising speed of 110 MPH. The company’s inaugural flight 85 years ago from Honolulu to Hilo, with a stop on Maui, took one hour and 50 minutes. The first flight to Kaua’i was made the following day and all the Hawaiian Islands were soon receiving air service on a regular basis. Introducing Hawai’i’s first inter-island jet aircraft in 1966. Today, Hawaiian Airlines has a fleet of 50 aircraft – 18 Boeing 717-200 jets for interisland flights in Hawai’i; 11 Boeing 767-300 and 18 Airbus 330-200 wide-body jets for transpacific and international service; and three ATR-42 for its new turbo prop service that launched earlier this year, ‘Ohana by Hawaiian. Hawaiian Airlines will have four more A330s joining the fleet by the end of 2015. By the end of year 2020, the airline plans to have 22 A330s total and 16 new narrow body A321neo aircraft, along with six new A330-800neo aircraft starting in 2019. 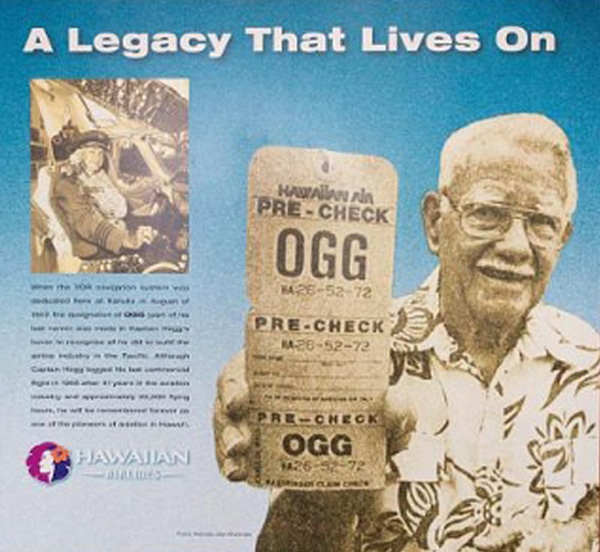 Video: Do you know why the Kahului Airport code is OGG? The code of this Hawaiian Airlines station is named after Captain Jimmy Hogg, an accomplished pilot who started his career as a mechanic’s helper with Inter-Island Airways of Hawaii then later became the Captain of Flight Operation for Hawaiian Airlines. This entry was posted in Hawaiian Airlines, Inter Island Airways (Hawaii) and tagged 154, Bellanca, Bellanca CH-300 Pacemaker, Captain Jimmy Hogg, Hawaiian Airlines, HNL, Honolulu, honolulu international airport, Inter Island Airways (Hawaii), Kahului, Kahului Airport, kahului maui, Maui, NC251M, OGG on September 16, 2014 by Bruce Drum. Copyright Photo: Ivan K. Nishimura. Please click on photo for other photos. 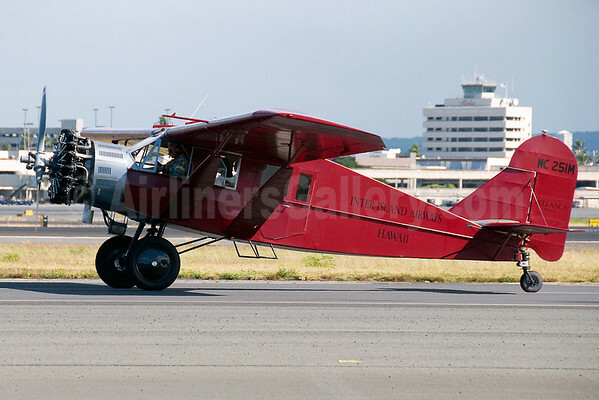 Hawaiian Airlines (Honoulu) yesterday (October 8) brought its original Bellanca CH-300 Pacemaker NC251M (msn 154) back to the islands to help celebrate its 80th Anniversary on November 11. NC251M is the last flying CH-300 in the world. The company had the aircraft restored into flying condition and the original 1929 Inter Island Airways markings for the upcoming ceremonies. The Bellanca started sightseeing flights on October 6, 1929 over Oahu to and from Koko Head. Two Sikorsky S-38 amphibians were also acquired in order for the new airline to start scheduled passenger service on November 11, 1929 from Honolulu to Hilo via Maui. On October 1, 1941 the company adopted the current name. This entry was posted in Hawaiian Airlines, Interisland Airways (Hawaii) and tagged 154, Bellanca, CH-300, Hawaiian Airlines, HNL, Honolulu, Interisland Airways (Hawaii), Ivan K. Nishimura, NC251M, Pacemaker on October 9, 2009 by Bruce Drum.